IV. Inadequate resource production . When congregational growth stalls and appears to hit a limit, the obvious question is to ask “why?”. In particular, has growth ended because of factors within the church, or factors in society? If there are no internal limits to growth then society will always eventually hinder growth, limit (I) above. However churches often cause their own growth barriers, not evangelising enough, (II); have enthusiasts, the evangelisers, who cease to be effective, (III); or not generating enough resources in the church to attract, disciple and retain people, (IV). The balance of enthusiasts and inactive believers in the church determines the evangelistic effectiveness of the church. Falling evangelistic purity will limit the congregation’s growth, regardless of the size of society. The model to represent this situation is given in figure 1. People are converted to church from outside. The cloud in the left hand of the diagram represents and unlimited supply of potential converts . The reinforcing loop R1 captures the action of the enthusiasts, the more enthusiasts the more converted, thus even more enthusiasts. I have assumed all new converts become enthusiasts first. Enthusiasts do not stay active in evangelism indefinitely, thus they become inactive after a fixed duration, balancing loop B1. Following the hypothesis, the conversion rate for each enthusiast depends on the evangelistic purity of the church. If the number of enthusiasts increases then the evangelistic purity of the church also increases. This reinforces the growth of enthusiasts, R2. However the more inactive believers the lower the evangelistic purity; a balancing loop resisting the growth of enthusiasts B2. If B2 is large enough then church growth will stop. A simulation of the model, for a given conversion rate, duration enthusiast, and ratio of enthusiasts to inactive in the church, is given in figure 2 . Church numbers are the sum of the enthusiasts and the inactive believers. A church of 30 people grows rapidly over 40 years, but is limited to just over 200 people as its evangelistic purity has fallen, figure 2. This limit is reached even though the pool of potential converts is infinite. It is a purely church induced limit, not affected by society. 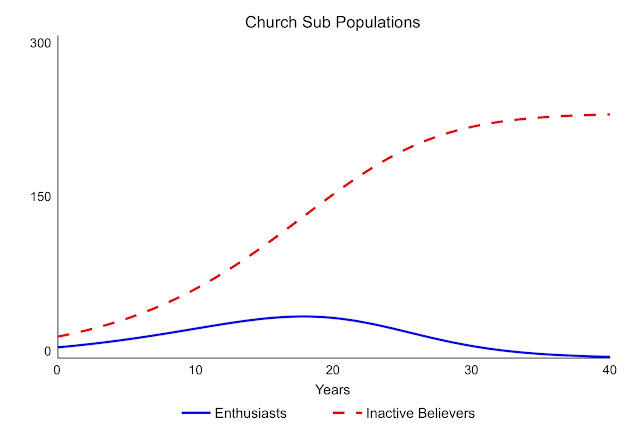 Looking at the two types of believers, it can be seen that although the number of enthusiasts rises, their growth eventually slows as they become increasingly ineffective in a church becoming dominated by believers with no interest in evangelism, figure 3. 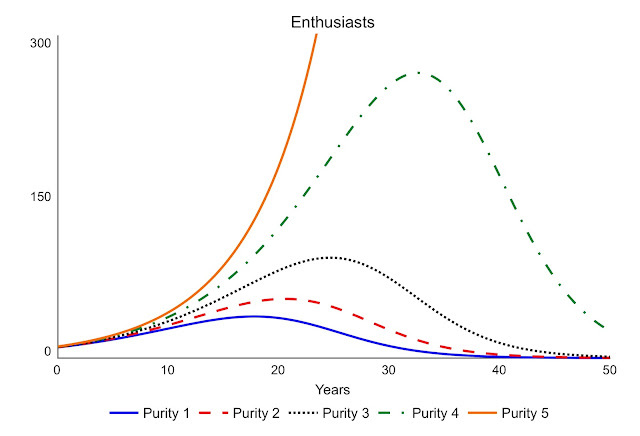 Enthusiast numbers peak and afterwards fall away. 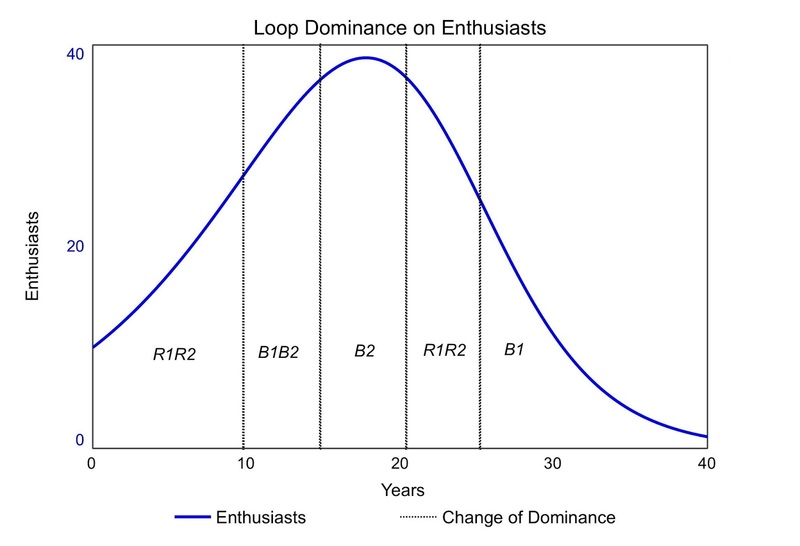 Analysing the cause of the changes in enthusiast numbers shows that it is the impact of the loop B2 that causes their numbers to fall and eventually halts church growth. Impact is a measure of the extent to which a feedback loop influences the curvature of the graph . Figure 4 shows the regions of loop dominance on the enthusiasts. 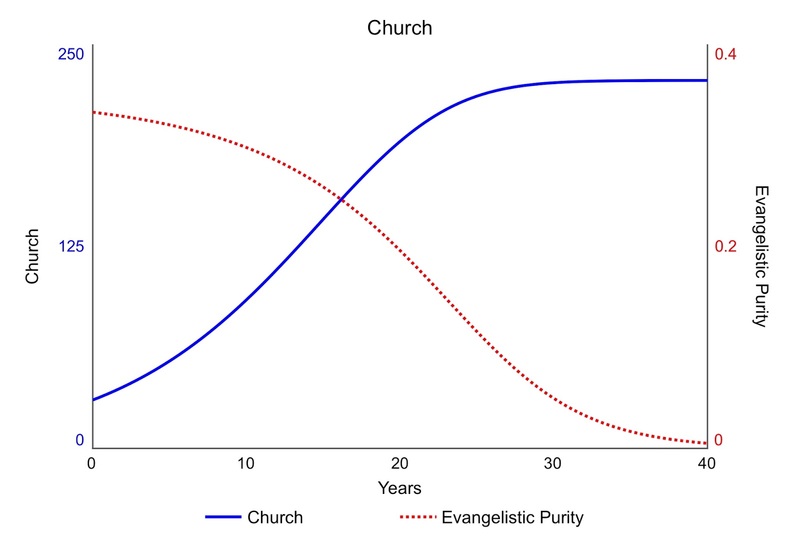 Enthusiast growth initially accelerates due to R1, their rising numbers, and R2, the influence of the enthusiasts on evangelistic purity, figure 4, first phase. The growth slows due to the generation of inactive believers, B1, and their negative effect on evangelistic purity, B2, second phase. 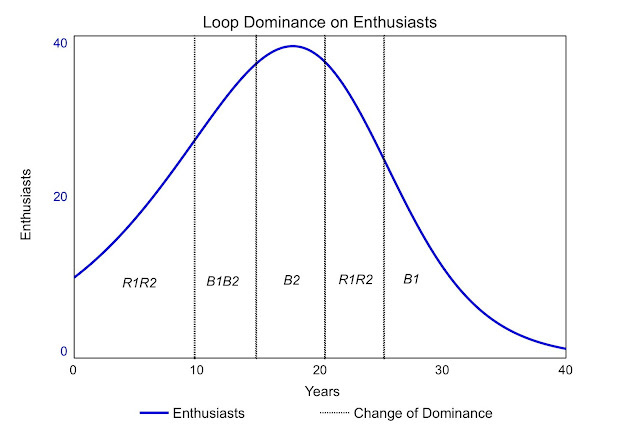 Loop B2 becomes so powerful it causes the number of enthusiasts to change from growth to decline as conversions fall below the loss of enthusiasts. This is the third phase. The decline in enthusiasts becomes faster, reinforced by falling conversions R1 and R2, the fourth phase. Decline finally slows as the remaining enthusiasts drain away, loop B1. 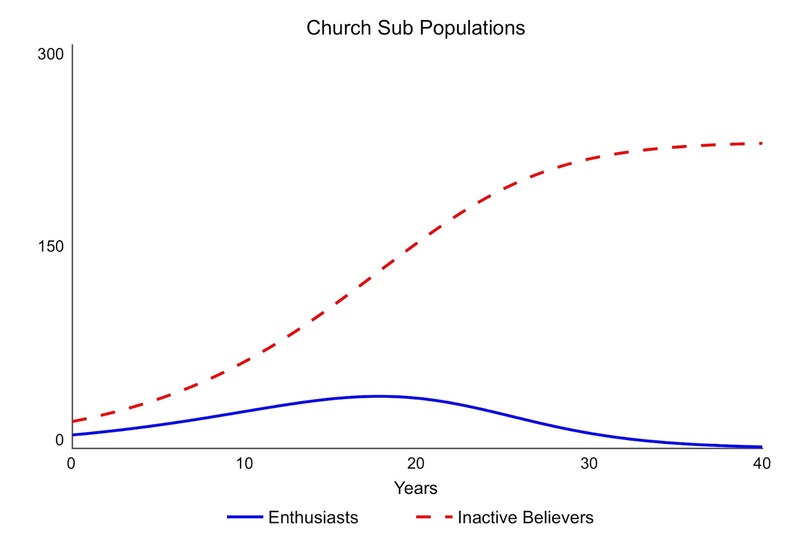 Thus the conjecture is demonstrated, falling church purity limits church growth, because the negative effect of inactive believers limits the generation of enthusiasts. 3. Have a church that has a greater balance of enthusiasts to inactive. Applying any of these three strategies raises the limit to the congregation’s growth, due to a larger generation of enthusiasts. 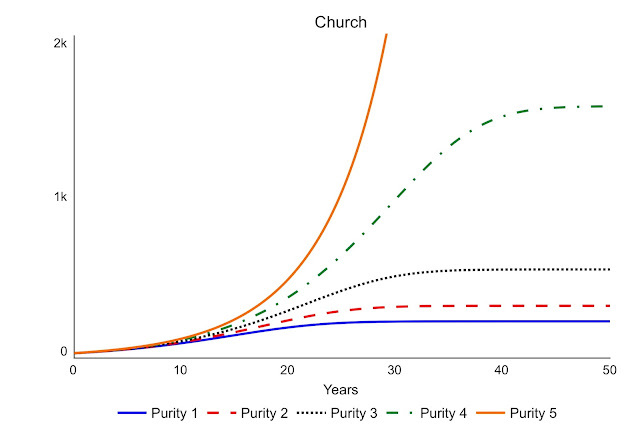 Figures 5 and 6 show the effect of increasing the initial purity of the church, the ratio of enthusiasts to inactive. 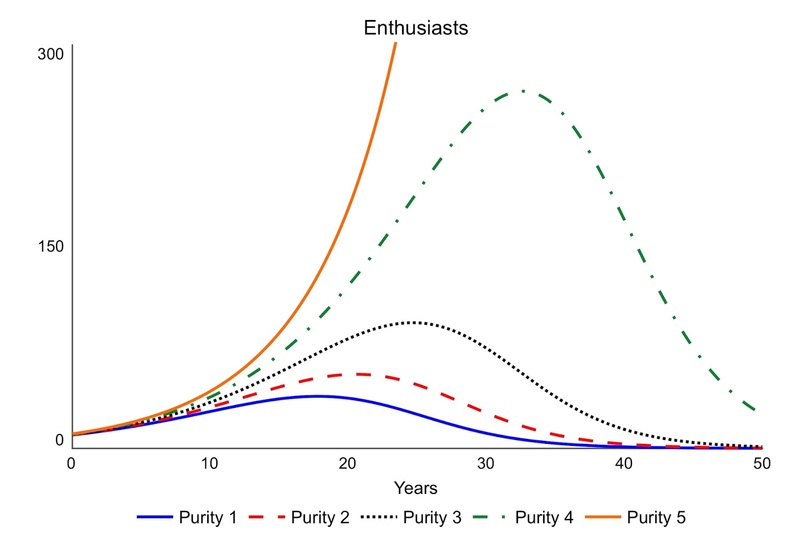 Purity 1 is the lowest; Purity 5 the highest. Thus the more evangelistically pure churches are able to reach a higher limit to growth than the impure ones. There comes a point if the purity is increased further, church growth continues indefinitely, curve Purity 5, figure 5, because enthusiasts continue to be generated, figure 6. Thus a sufficiently pure congregation can remove this barrier to church growth, and concentrate on the other barriers that come into play, not included in this model. It is good to know some growth barriers can be removed. One way to raise church purity is to allow the inactive to leave. It sounds counter-intuitive, but if church leaving increases, church growth increases, as long as it is the evangelistically inactive that leave. This is an example of Kelley’s hypothesis that a stricter church is stronger and thus more likely to grow . The principle of evangelistic purity encouraging growth can apply across all churchmanships, not just conservative or evangelical ones, as purity refers to participation in the mission and recruitment to the church, rather than theology as such. It may be possible to show that certain theologies are more likely to encourage evangelistic purity, particularly ones that see the need for personal salvation. But that takes us beyond this simple model, which shows that having enough people in the church committed to evangelism can remove a barrier to church growth. Limits to Church Growth – Part 1. Lack of Supply & Lack of Demand. Limits to Church Growth – Part 2. The Reproduction of Enthusiasts. Hayward J. (2015). Newton’s Laws of System Dynamics. Presented at the 33rd International Conference of the System Dynamics Society, Cambridge, MA, July 2015. Kelley D. (1986). Why Conservative Churches are Growing: A Study in the Sociology of Religion. Mercer University Press.